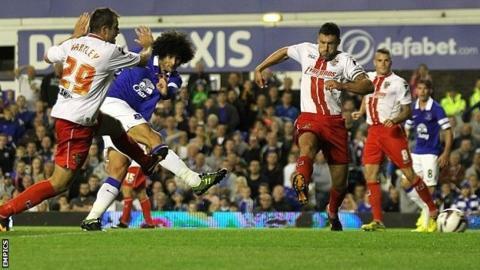 Marouane Fellaini's extra-time goal against Stevenage in the Capital One Cup earned Roberto Martinez his first win as Everton boss. Stevenage went in front with their first shot of the game, Luke Freeman scoring after Everton failed to clear Oumare Tounkara's cross. But Spanish teenager Gerard Deulofeu equalised on the stroke of half-time when he curled in after a jinking run. Substitute Fellaini sealed victory five minutes from the end of extra time. The Belgium international midfielder, who has been linked with joining former Everton boss David Moyes at Manchester United, received a good reception when he joined the action after 96 minutes and promptly reminded Goodison Park of his value, his close-range strike sending the Merseysiders through to a third-round clash with Fulham. Stevenage had proved tough opponents, however, and almost snatched victory in the last minute of normal time through boyhood Everton fan Greg Tansey. Deulofeu, who is at Goodison on a season-long loan from Barcelona, was one of four players to make their full debut in a much-changed Everton side. England full-back Leighton Baines, who is also interesting United, was an unused substitute but was also applauded as he warmed up.